National Review Online recently ran a piece celebrating the 25th anniversary of Clint Eastwood’s award-winning movie Unforgiven, and declaring it to be “the last great American Western.” As someone who can’t get enough of great Westerns, but made the mistake of paying to see Unforgiven when it was released, I cringed. Hollywood lost its taste for Westerns a lot longer than a quarter-century ago. The last great one was probably Silverado, way back in 1985. Since then, there have been two pretty good if overwrought movies about Wyatt Earp, Kevin Costner’s enjoyable but unmemorable Open Range, some remakes ranging from mediocre to abysmal, a pair of shallow Young Guns movies starring the Mutual Egomania Society, and 1995’s The Quick and the Dead, which never quite fulfils its ambition of becoming a cartoon. Even among that sampling, Unforgiven doesn’t rank particularly close to the top. The reason so few Westerns are made anymore is the same reason Unforgiven is not a good Western. Truly great Westerns tend to be moral movies, in which the protagonist seldom has trouble discerning what’s the right thing to do, but finds that doing it is very difficult, and often unpopular. As much as liberals may mock it, “a man’s got to do what a man’s got to do” is a theme with which American audiences connect, as the timelessness of High Noon, Rio Bravo, The Man from Laramie, and even Blazing Saddles will attest. 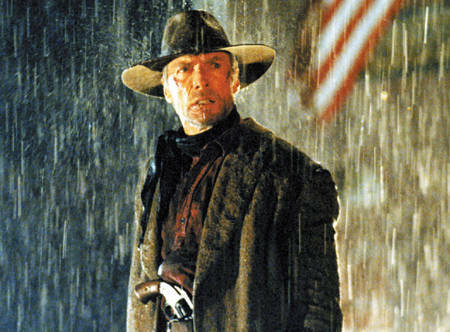 Unforgiven is a product of a school of thought that rejects conventional understandings of right and wrong, to the point that it considers the very concept of heroism to be an affront to “realism.” Not only is Eastwood’s character not a hero, but he’s by far the worst among the unanimously awful characters in the story. To the degree that you even care who shoots whom in the end, you’ll probably find yourself rooting for Sheriff Little Bill, played by Gene Hackman. At the theater where I saw Unforgiven, the audience did not react as if it had just seen a great Western. Rather, viewers quietly meandered into the parking lot, looking like a bunch of confused kittens that just tumbled out of a clothes dryer. The most pronounced reaction from the crowd came when Hackman scolded Eastwood for shooting an unarmed man, to which Eastwood replied, “Well, he shoulda armed himself.” The chorus of laughter quickly subdued itself, with the realization that the line wasn’t meant to be funny. No, this movie is not great, not classic, not even okay. If not for the excellent performances of all the main actors, it would probably have become an infamous turkey. It’s tempting to blame society for Unforgiven, and by extension for the demise of the Western, by saying the film is a product of its time, being released at the dawning of the Clinton era. If that were the case, however, they could have billed it as the amoral, ultraviolent visual assault that it is, and just waited for the people to come stampeding into the theaters. Instead, the studio resorted to subterfuge. The trailer for Unforgiven begins with the words, “It was a matter of honor,” which is an absolute lie. The motives of Eastwood’s character, the groan-inducingly named William Munny, are purely mercenary. Although the trailer does reference Munny’s criminal past, it frames the story as one of redemption, not recidivism. The wrongdoer-turned-hero that prospective moviegoers were led to expect might in decades past have been played by Randolph Scott or Jimmy Stewart. It’s impossible to imagine either of those actors playing the worthless, irredeemable William Munny who actually appears in the film. For all of Munny’s protestations that “I ain’t like that no more,” in truth he’s exactly like that, right to the end. It’s gotten so you can tell the age of a movie by how accurately it is reflected in its trailer. If you rent DVDs, and you make a habit of watching the trailer after seeing the movie, you’ll notice that in the 80s and earlier, the trailers tended to give a fairly accurate summary of the movie. Starting around the time of Unforgiven, there seems to be a recognition on the part of the studios that they’re selling something that the people don’t want, so they have to make it look like something else. That’s what they’re doing when they remake Westerns, also. The tactic is to lure people to the theaters under the guise of reproducing a classic, when they’re really just passing off the same anti-heroic drivel as usual. In the original 1957 version of 3:10 to Yuma, rancher Dan Evans, played by Van Heflin, agrees to hold dangerous gang leader Ben Wade (Glenn Ford) in custody, and take him to the train station for delivery to Yuma prison. Evans takes on this assignment for the reward money so that he can save his ranch, which is failing due to a lengthy drought. After multiple attempts to have his men kill Evans, Wade finally decides to help him by boarding the train instead of taking the opportunity to escape. Wade does this because he has come to respect Evans, and feels indebted to him over an incident that took place along the way. In this version of the story, Dan Evans is a hero. The remake, released 50 years later, stars Christian Bale as a rancher named Dan Evans, but the similarities end there. Bales’ Evans is not a hero, but he is a victim, which in today’s Hollywood is far superior. Rather than suffering a run of bad luck, this Evans is being forced from his land by a cabal of typically sinister railroad men, who of course are also racist, because that’s the only way moviemakers can recognize evil through their otherwise value-free vision. When Wade (played in this version by Russell Crowe) decides to help Evans, it is because he is moved to pity when Evans whimpers at his feet about his sorry lot in life. In this version, Wade and Evans never make it to the train together, because Wade’s men kill Evans before they have a chance. Wade then inexplicably guns down every member of his own gang before boarding the train himself, in what has got to be the most unsatisfying ending since … oh .. Unforgiven, 15 years earlier. Once again, there is no hero, but only one bad guy killing lots of others. There’s nothing great about taking away the viewers’ rooting interest in a movie. There’s nothing realistic about a world without heroes, in which hardly anybody has any redeeming qualities. There can never be another great American Western as long the prevailing narrative is not a man’s got to do what a man’s got to do, but instead is only that men do stuff, and then you die. The movie Unforgiven is not responsible for the ignominious demise of the heroic Western. It is only a symptom of an ailment that had already been spreading through the movie industry for the better part of a decade, and has continued ever since. Nevertheless, Eastwood’s dishonestly advertised movie remains unforgiven by this particular moviegoer, who still wants his four dollars back.